In this powerful painting, Z.S. 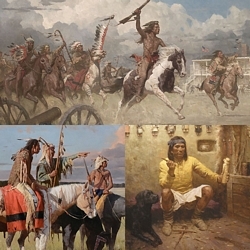 Liang portrays the Weather Maker of the Blackfoot people during the days of the sacred Sun Dance. He is believed to have the special power to communicate with the Great Spirit in controlling the weather. The Weather Maker’s spiritual robe is decorated in various symbols identifying visions from his dreams: eagle feathers, birds, animal skins and extraterrestrial objects.